WinTopo Freeware is totally free for you to use - you do not need a license code for the freeware version. 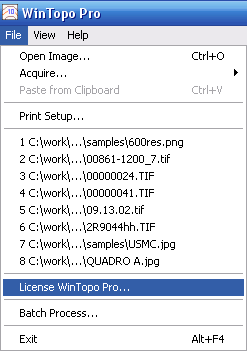 WinTopo Pro requires a license. 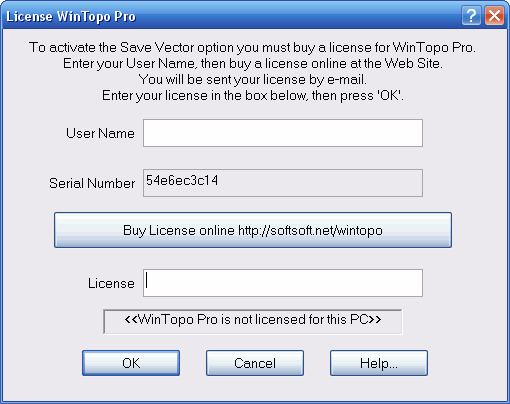 After you have downloaded and installed WinTopo Pro you can try out all its features, but you will not be able to fully save your work from it until you buy a license. 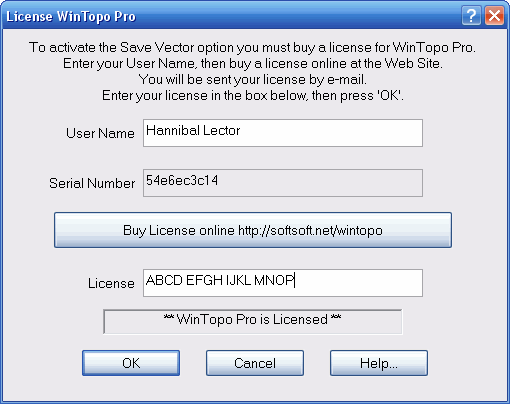 In the boxes on the web page, enter your desired WinTopo Pro User Name, the Serial Number (you can use the mouse to paste it in the usual way, if you copied it from the WinTopo Pro License window), and the e-mail address to which you want us to send you the License. Click on the Buy Online button. You will be taken to the WorldPay secure payment page. Select your prefered payment currency, and enter your credit/debit card details, and click on the Confirm Order button. WorldPay will show you a summary of the transaction and ask you to confirm it. Then the transaction will be processed, and the purchase price will be taken from your credit/debit card account. WorldPay notify us at SoftSoft.net that you have paid, and we e-mail the License to you, at the e-mail address which you gave on the web page.